You like most other Stripe users enjoy the simplicity of Stripe as a payment gateway. But you lack the in-depth reporting and insights required to process your Stripe data inorder to grow your business. Putler is zero configuration tool that provides you accurate reporting and actionable insights for Stripe. Why Stripe is a crowd favorite? 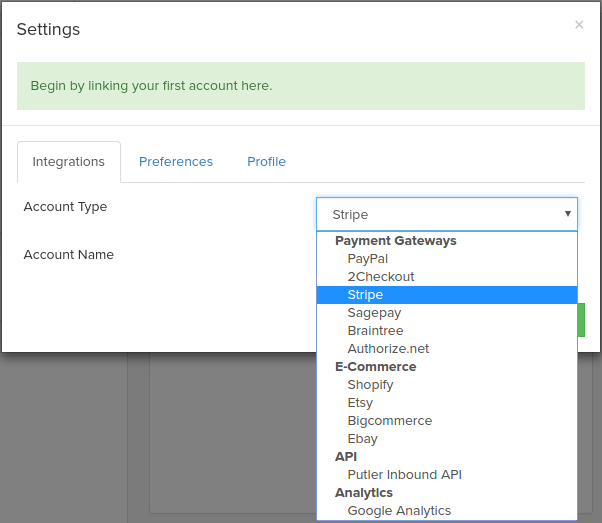 Stripe is an easy-to use payment gateway loved by online businesses & web developers for its simplicity and power. With Stripe, you can accept Visa, MasterCard, American Express, Discover, JCB, and other cards directly on your store. Stripe’s built-in account reporting helps you keep track of overall sales, payouts, orders, customers and products. You can generate custom reports using the stripe api. Stripe’s reporting dashboard is good to get started with. You get to know your monthly summary report, monthly activity summary, transfer and balance summary, transfer reconciliation, account activity reports and other reporting options. But as your business grows, you would like to have more comprehensive analytics for Stripe. Stripe’s core reporting capabilities are decent but you need in-depth reporting inorder to know the pulse of your business and scale accordingly. Thus, many companies offer comprehensive reporting integrations for Stripe. Some popular stripe reporting tools include Putler, Baremetrics, ChartMogul, GetControl, MRR.io, etc. Is Putler The Best Reporting & Analytics Tool For Stripe? Putler is useful for SaaS startups as well as all other online businesses. In addition to basic basic reporting and sales analytics, it also has many unique features. No switch over to multiple accounts: Unlike Stripe where you need to see individual data and add data manually from each account for total value, Putler provides all data at one place combined. Integration with Google Analytics: Putler integrates with Google Analytics and generates visitor insights that are relevant for your business. Thus you get visitor analytics and e-commerce analytics at one place. Consolidation: You can accurately combine multiple Stripe accounts, other payment gateways, shopping carts, currencies and even Google Analytics and fetch reports in a single dashboard. Product, Customer, Sales analytics: In-depth reporting with 153+ practical metrics, trends, overviews and drill downs. Subscriptions Analytics: For subscription businesses, all the important metrics like MRR, churn rate, LTV, ARPU, etc. are very crucial which are not available in Stripe. But Putler provides a neat dashboard having all these metrics. 10x faster day-to-day operations: Complete transaction lookup, refunds, subscription management, export and other tasks within seconds. Deep growth insights: Get expert advices and unique intelligent recommendations to grow your business. Integrating Stripe into Putler couldn’t have been easier. Our company has used Putler for several years now and it’s an invaluable tool for our management team to monitor daily sales as well as quickly assess our financial goals and find potential weak spots in our pricing. Click on Continue. It will ask you to enter your Stripe credentials. Enter it and you will see instant reports of your business. Why you need Putler reporting for Stripe? Stripe reports are good. But they are limited to data. Inorder to know where your business is headed to you need intelligent insights like MRR, LTV, Churn and dozens more! Putler instantly process your Stripe data and provides such insights which help you grow your business with ease.